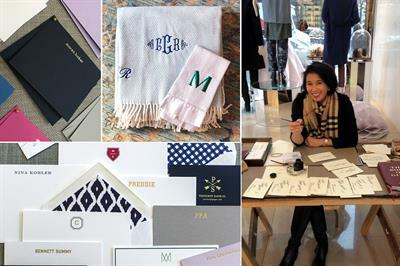 For this season's gifting and entertaining, Maze Home hosts Customize Your Holiday, a gathering of local artisans creating hand-lettered monograms, personalized foil pressed stationery, and made-to-order embroidered throws, linens and more. Same day pick-up available for most items! The two day event features: Wilmette's Katherine Glattard of Calligraphy by Katherine, Jennifer Ackerman of PostScript Paper of Chicago and Maze Home's Cari Raymond.